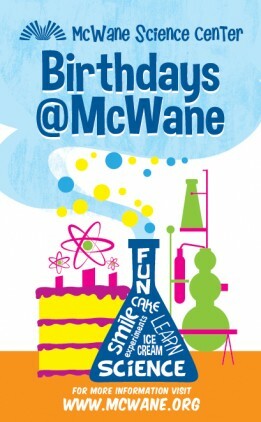 McWane Science Center has all the elements to make your child’s birthday party unforgettable- it’s a little bit of SCIENCE and a whole lot of FUN! Enjoy a private party with your friends and enjoy hands-on learning on four floors of Adventure Halls. With our all new birthday party packages, planning your child’s party has never been easier. We have birthday parties down to a science! 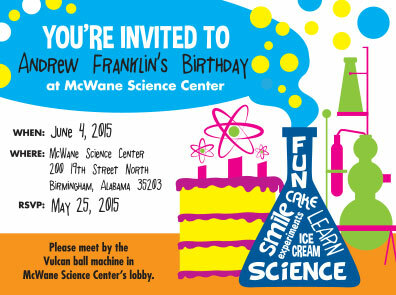 Call 205-714-8323 or email birthdays2@mcwane.org to book your party today! *Total number of guests includes every child and adult at the party. **Tax will be added to each Add-On Option. Click here to customize and download your own pdf invitation. Full payment is required at time of booking. Prices do not include required tax.